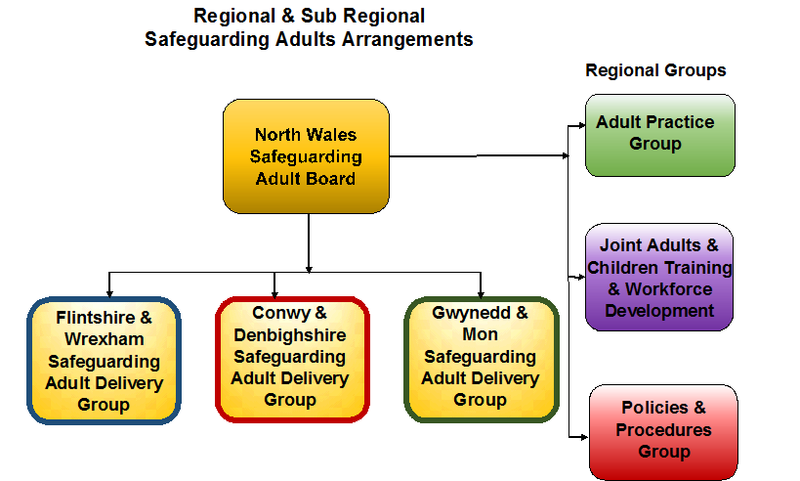 Section 134 of the Social Services and Well-Being Act (Wales) 2014 requires that regional Safeguarding Adult Boards be in place from April 2016. This will put the safeguarding of adults on to a statutory footing similar to that for safeguarding children. North Wales decided, ahead of the legislation being in force that it would commence the planning phase to establish a North Wales Safeguarding Adults Board (NWSAB). Within the structure of the NWSAB, three local delivery groups were to be created by the six local authorities forming as Gwynedd and Anglesey; Conwy and Denbighshire; Flintshire and Wrexham. It was also proposed that areas such as training, performance and audit, policies and serious case reviews should be undertaken regionally. This structure followed the same pattern as that in Children’s safeguarding. Employ the right people and have safe employment practices, have good corporate safeguarding practices in all agencies, including commissioned and contracted services. Develop a training plan, have regional standards, and good regional policies & procedures, have strategies for: Communications – internal & external & Working with other partnerships. Learn, and share the learning from: Practice Reviews, Inquests, and Sudden Untoward Incidents. Adult Practice Review Group to which all agencies contribute, strong Delivery Groups, and feedback loops to ensure learning & shared implementation with clear remits for sub groups. Ensure good representation on SAB and delivery groups and correct terms of reference. Abuse, neglect, sexual and financial exploitation at home, in care homes, hospitals and other places, raise awareness everywhere, and for all vulnerable people. Empower vulnerable people by use advocates / intermediaries and ensure there are good links and conduits for messages: Media, Partnerships, Website. Establish Clear routes for all people to get information, share good practice and learn. Have clarity around roles and responsibilities, clear reasons for groups and membership. By raising the profile of adult safeguarding and improving multi-agency working. Have a consistent approach and common understanding, awareness / training. Integrate providers and share good practice undertake Provider forum; feedback. Have standards for: Investigations, Plans and DoLS, better use of intelligence, analysis & learning lessons. Clarity in how structures link back to practitioners and stakeholders, quality – influence on work. Awareness, preparedness – e.g. for Adult Practice Reviews, development of Policies & Procedures, learning – form good and poor practice, cases, communication, streamlined governance & functions. Direct and monitor regional groups for training and workforce development; policies and procedures; communication and consultation and adult practice reviews.